I was looking for a not-obnoxious purple colored ottoman that was small and this fit the bill. I use it in my office in front of a pull out sofa, but it can be easily pulled aside to pull out bed and doubles as extra seating. Very nicely made. The quintessential storage ottoman, Amelia is transitional in design with button tufted removable quilted top and oak legs with pretty pickled oak finish. Practical and fashion right, plum upholstery is striking in living room, family room or master suite. 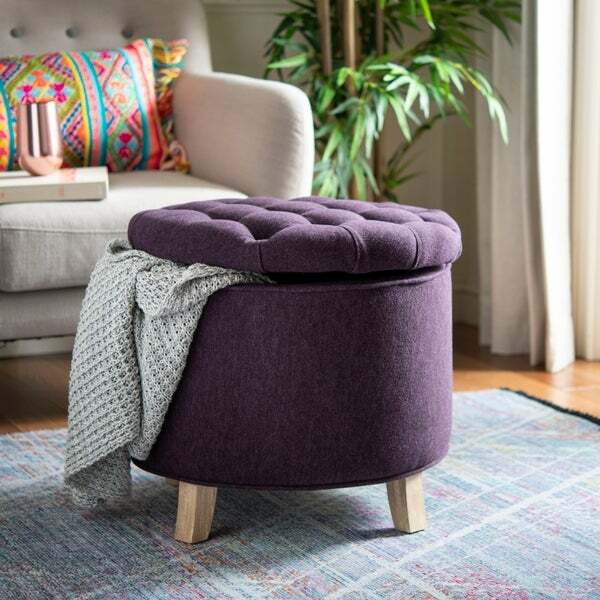 We absolutely LOVE this Safavieh Plum Ottoman! The photo does NOT do it justice! The purple is absolutely gorgeous.. more like an eggplant! The material is very high quality! It's well designed and made! We get a lot of compliments on it too! So happy with this purchase! Love this piece! Bought it for our large closet. We use it to store things. But we also use it to sit on while putting socks and shoes on. Great color! Perfect! Love these; purple color is vibrant and add a pop to living room. Great storage capacity. They were a little tall for foot stools in front of couch but the legs are detachable. This ottoman is perfect. Not only is the color AMAZING but it is so spacious for storage inside, not to mention super comfortable to sit on! This ottoman was depicted as it is. The color is even as it looked in the picture. It's exactly what I needed. It came intact, I didn't have to assemble it. I use it everyday and am very pleased! I love this ottoman. It's sturdy and well made. I took the feet off to make it more level with my chair. The fabric does seem to attract cat fur so I roll it with a lint roller. Very nice color! I use this unique foot stool for sitting at my vanity doing my make-up. The height and girth makes it just right for this use, it also gives a nice pop of color. I also appreciate the storage it gives me. A very versatile piece of furniture. this is perfect for my teens room. Love that is has storage, perfect for blankets. I had been looking for the perfect purple ottoman for my bedroom, and this item definitely fit my needs. It’s a darker purple which I wanted. Such good quality for the price! A little smaller than it looked in the photo but perfect for my small space. Great storage piece and definitely worth the price. The color matches the image shown. Nice piece, functional and attractive. I am putting this in our bedroom, it is very attractive, perfect! This is the most beautiful piece fo rmy whimsey purple and pink guest bedroom, really love it. I needed a hint of another color for my living room and thought purple would go nicely. I am eclectic in style but try to not overdo it. We need an ottoman to go in the center of our new sectional for people who don't get to recline and I needed it to be the height of the sectional. I also needed it to fit in the space and still be walk around the coffee table. This size was perfect and I needed round since my coffee table is square. "Can these legs be removed?" "Cant these legs be removed?"